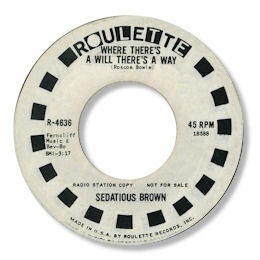 The lovely name of Sedatrius Brown may not be one on every soul fan's lips, but I'm hoping that this page will at least alert a few more to the great 45 she cut for MGM. Wise Fool starts as though we're in for another uptempo workout but after 30 seconds the song slows down into a classic piece of New York balladry. The chord changes are just perfect and Sedatrius sings her heart out - lovely deep pitch her voice had. 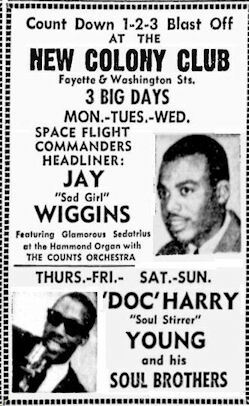 The pianist deserves a mention for the tasteful fills - and since Sedatrius is described on a Baltimore poster as "glamorous Sedatrius at the Hammond organ", might even be her. Her Roulette 45 is well worth a listen as well. Where There's A Will There's A Way is a waltz time big city cry ballad of some power, again with very good chord changes. The impact is made by Sedatrius' deep tones and a big big horn section. Sadly her Clayton 45 is too jazzy for my taste. 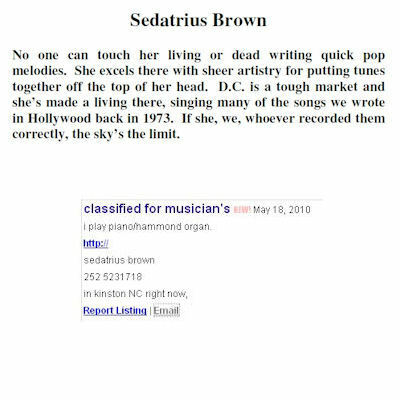 UPDATE ~ Pete Nickols has written to say that he has been in contact with Sedatrius herself - now as SEDATRIUS BROWN BOXSLEY - saying among other things that "I have written so many song's of my own. I also play the piano, and the hammond organ. I took a long rest, and now I'm ready to play again." Sedatrius is now the musical director of the Kinston, NC High School Gospel Choir where she now lives. Pete has also found some excellent images which are included here. I'm very grateful to Pete for all his efforts. UPDATE ~Mike Cassidy kindly writes with the good news that Sedatrius is still doing her thing as you can tell here. 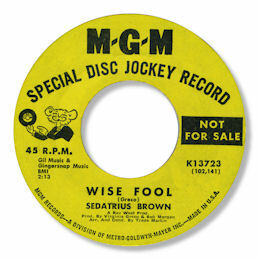 Note ~ Sedatrius Brown also recorded as a vocalist on jazzman Pharaoh Sanders set "Village Of The Pharaohs" from 1973. Thanks to Matt Starr and John Smith for kind permission to feature his poster here.